#3-1. What is the childish face that most Koreans have preference for? This article will take a look at what the Korean childish face and the characteristics of a beautiful face that Koreans prefer. In Korea, it is well known fact that Koreans usually prefer a childish face for long time. ‘Childish face is similar expression with baby face or youthful face in literatures. Our world seems to be in the grip of ‘Baby face or childish face’ fever for every new and advertisement related to cosmetic products and aesthetic procedures. Korean word “Dong-Ahn” literally means a “childish face” and sometimes it is translated into baby face or youthful face), which refers to a face that have facial characteristic features of a child. According to studies, a childish face is a face that seems to be free from the anatomical changes and degradations that come with age. What actual differences of anatomic characteristics exist between a child’s face and an adult’s face? Anatomically speaking, although a child’s cranium appears relatively larger than the facial bone, the cranium is not actually larger but it rather comes from the fact that the facial bone is relatively smaller. The chin, nasal cavity, and maxillary sinuses are small and orbital bones are very close to the teeth. Meanwhile, in an adult, the horizontal line connecting the bottoms of both orbits divides the craniofacial bone into two equal parts. With computer simulation, Todd et al2 proved that that facial growth is more pronounced in the lower face than the upper and middle face. In details, in the craniofacial bone’s anatomical sequence of growth, the posterior maxilla first grows horizontally. Then, both the anterior and posterior maxilla grows vertically at the same time. This is followed by the growth of the nose, maxilla and palate. The mandible is progressively developed into both the anterior and posterior direction by coordination of maxillary growth. Then, the temporal lobe and midbrain gradually grow in size. After this, there developed remarkable change in the size of frontal bone and as maxillary complex. From this structural change, the mandible grows further and maxilla protrudes anteriorly, and followed by expansion of mandibular bone into antero-posterior direction and this result in the increase of width and height of mandible. The brain grows further and the cranium enlarges. Lastly, nasomaxillary complex grows both horizontally and vertically to achieve teeth growth with harmonized development of maxilla and mandible. Then the cheeks bones further develop. In summary, it is important that the maxillomandibular growth occurs in balance but the development of the mandible follows that of the skull base and maxilla. Accordingly, childish face has relative small mandible in respect to ordinary adult face. In fact, mathematical analysis of a child’s face using BAPA (Balanced Angular and Proportional Analysis), a metrical analysis program that I had developed, computes the results shown in <Image 1>. Image 1. Mathematical analysis of a child’s face. Child’s face has relatively higher eyebrow position than an adult’s. We can easily find that a child’s face has relatively large, vivid, and clear eyes in respect to an adult’s eyes, which is emphasized with a definite distinction between the dark black pupil and pure white sclera. Considering overall harmony and balance of facial aesthetic subunits, the interpupillary distance of child is relatively shorter and the overall facial length is relatively shorter than that of an adult’s face. The child face has distinctively small lips, short chin, and small mandible. 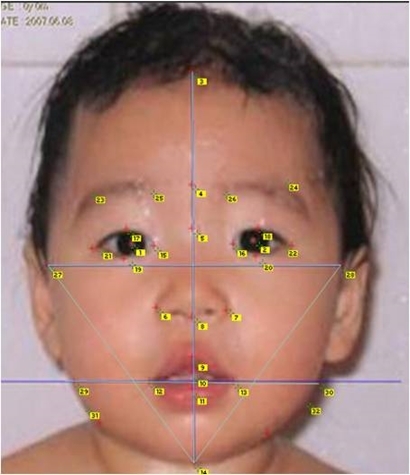 The graphs on the right of <Image 1> show the quantitative and arithmetic characteristics between measurements of an average attractive Korean female face and those of a child’s face. Photogrammetric analysis shows that the vertical length of the child’s face is 91.38% of that of a standard attractive face. The width of the upper face of a child is 94.41% and the lips are 93.58% of those of an attractive face. Relative harmony or structural balance of chin in a child’s face is 98.73%, which is within one standard deviation (1SD) of average attractive Korean female face’s data. All the facial features of a child are comparable to those of an average attractive face, except for the chin being rounder. According to my sampling study, the faces of baby models seen in films or commercials have relatively large eyes (166% of those of an adult), a shorter interpupillary distance (95%), shorter face length (81%), a smaller and shorter chin (93% and 70%, respectively), smaller mouth (76%) and more plump and voluminous cheeks (105%). These kinds of peculiar characteristic of a child’s face are very reflective of the standard attractive female face that Koreans usually want to have. Meanwhile, we see that selfies, where one takes a picture of oneself, abound on SNSs. In the current craze of selfies, Internet users take various photos of themselves and post the best looking ones online. 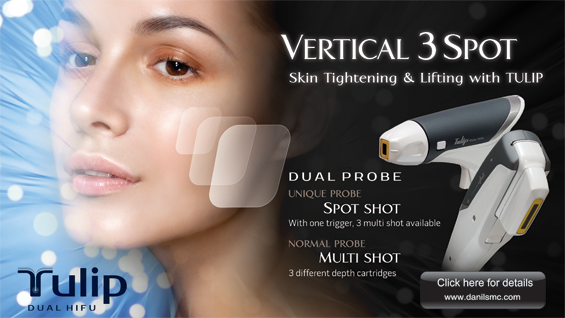 The ‘selfie angle’ refers to the optimal angle of the camera which is 30~45 degrees above the face where the resulting facial photos show a more youthful, beautiful, and attractive face.3 This is another social phenomenon proves that Koreans has peculiar beauty preference for certain facial features.